McAfee Desktop Firewall 8.5 includes multi-layered protection through inbound and outbound traffic monitoring, policy enforcement and reporting, select intrusion prevention capabilities and application monitoring. With McAfee Desktop Firewall 8.5, administrators can now control access for traveling or remote users through Connection Aware Policies, which apply a pre-defined firewall rule set based on whether the user connection meets certain criteria – helping to increase network security by reducing exposure to potentially unsecured network connections. Mobile users and road warriors access the corporate infrastructure in different ways, such as broadband, dial-up and virtual private network connections (VPN), and each method of connection requires unique control policies. 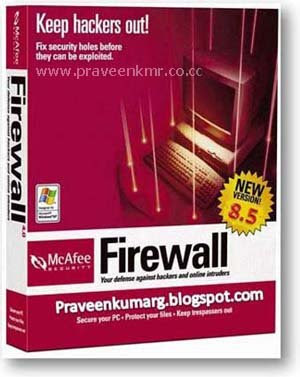 McAfee Desktop Firewall 8.5 gives organizations the flexibility to selectively define different polices based on whether the user has passed a number of connection criteria, such as verifying the gateway IP and Mac address prior to connection to the home network. Once verified, McAfee Desktop Firewall 8.5 can issue a separate policy rule set that provides specific network access privileges to the client. In a recent Forrester study among SMBs and enterprises, companies rated viruses and worms as the most serious security threat, but were not always investing in the right tools to defend against these threats, said David Friedlander, senior analyst, Forrester.Personal firewalls are no longer a nice-to-have – they are a necessity. Companies should install personal firewalls on all machines that leave the corporate network. In addition, they should protect their desktop computers, which become vulnerable to malicious code the second a remote machine plugs back into the corporate network.